Sunbathers heading for a dayat the beach in Southern California may havemore to worry about than sunscreen. A new study by researchers at the UCLAHenry Samueli School of Engineering and Applied Science shows that bacteriaknown as Escerichia coli and enterococci are prevalent in the toplayer of sand at some of the area's most popular beaches, even when thesurrounding ocean water tests "clean." UCLA civil and environmentalengineering professor Jennifer Jayand graduate researcher Christine Lee conducted a survey of beaches in the Santa Monica Bay,ranging from Redondo Beach to Malibu. Their research study, due to bepublished in an upcoming issue of the journal Water Research, shows that whilethe water bacteria levels at area beaches may meet state health standards, thesand itself may act as a source of bacteria. More disturbing, however, is that thebacteria were found in their highest concentrations in the sand of enclosedbeaches often favored by parents with toddlers because of their lack of surf andmore protected coastline. Usually associated with feces, both Escerichia coli and enterococci bacterialevels are used routinely to determine the quality of water at recreationalbeaches, and both are used as indicators of the possible presence of otherharmful microorganisms. But while water quality at local beaches is monitoredon a daily basis by local city officials, the microbial quality of beach sandis continuously overlooked. "Southern Californians are aware of swimming advisories and beach closingsdue to contamination of the water. But what is startling about our findings isthat even when the water shows low bacteria levels, there are still high levelsof bacteria that persist in the sand," Jay said. "This is particularly relevant when we'retalking about sheltered beaches such as 'Mother's Beach' and the enclosed partof Cabrillo Beach, for example, which appear to bemore conducive to the persistence of these bacteria. The levels of enterococci were approximately 1,000times higher than the levels observed at the beaches open to the ocean," Jaysaid. Other high offenders included theenclosed portion of Cabrillo Beach in San Pedro, and Topanga Beach, just northof Topanga Canyon Road in Malibu. High levels of bacteria also were found at Santa Monica Beach near the pier. Both Malibu's SurfriderBeach and Redondo Beach showed lower levels of bacteriarelative to the other test sites. "Due to their enclosed nature, 'pocket'or enclosed beaches show the highest levels of bacteria present in the sand.These more enclosed locations are, for good reason, popular with families. As aparent of two young infants, I know firsthand children tend to put things intheir mouths, including sand," Jay said. "That concerns me." Because health standards for beachsediments have not been developed, there is no strict standard to evaluateexactly how much of a health risk these bacteria actually pose. "The survival of these 'indictorbacteria' organisms in sand points to the persistence of other disease-causingorganisms in the sand, which could be very significant," Jay said. "But wedon't yet have enough data to know how significant. 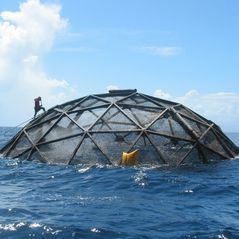 More research needs to bedone in this area." "What this study ultimatelyshows is the importance of monitoring bacteria in the sand as well as thewater, particularly at enclosed recreational beaches," Jay said. The beaches tested by UCLA Engineering'sstudy include Malibu's Surfrider Beach, Topanga, Will Rogers Beach, SantaMonica (north and south), Dockweiler, Venice Beach, Manhattan Beach, RedondoBeach, Cabrillo (open and enclosed) and Mother's Beach (enclosed). Jay and her researchers arenow working on a second study that will focus on the persistence of viruses inbeach sediments. Jay will be delivering a lecture at UCLAEngineering on this recent study, called "SantaMonica Bay Beaches: What You Need to Know AboutBacteria in the Sand," at 7 p.m. on Wednesday, May 24. Admission isfree, but R.S.V.P.s are requested. Parking is available in campus Lot 9 for $8. Interested participants should register at http://www.engineer.ucla.edu/events/jay.html. Last year,UCLA Engineering's Jay was chosen as one of only 20 young National ScienceFoundation-supported scientists and engineers to receive the prestigiousPresidential Early Career Award for Scientists and Engineers. 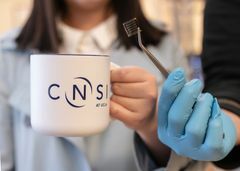 Bestowed by President George W. Bush, the award is thehighest national honor for investigators in the early stages of promisingscientific careers. Establishedin 1945, the UCLA Henry Samueli Schoolof Engineering and Applied Science offers 28 academic and professionaldegree programs, including an interdepartmental graduate degree program inbiomedical engineering. Ranked among the top 10 engineering schools amongpublic universities nationwide, the school is home to six multimillion-dollarinterdisciplinary research centers in space exploration, wireless sensorsystems, nanotechnology, nanomanufacturing and nanoelectronics, all funded byfederal and private agencies. For more information, visit http://www.engineer.ucla.edu/. 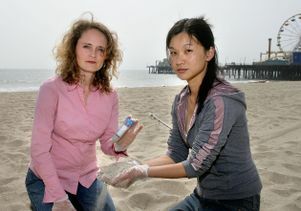 UCLA Engineering professor Jennifer Jay and researcher Christine Lee. 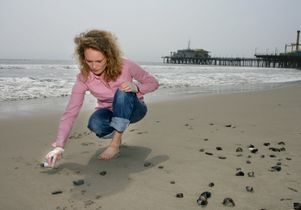 UCLA Engineering professor Jennifer Jay takes sand samples in Santa Monica, Calif.